You can change your period. That’s right. You can actually change your whole period experience and you can change it so that your period is different, better, by next month. This sounds miraculous, but it’s actually very matter-of-fact, logical, evidence-based, and science-supported. If you have an awful period – I’m talking cramps, heavy bleeding, PMS-orama, acne, bloating – it does not have to stay that way. We have been fed this myth that your period is just your period and it will be that way til menopause, just as it was for your mom and her mom before that. That myth prevents women from taking action when they could and should. 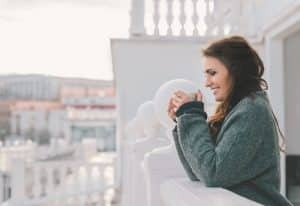 In this post, I want to tackle some of those things that make a period unpleasant and horrible to deal with. All of these issues can be dealt with using these outlined period hacks. You can use diet and lifestyle changes, along with some supplements, to be rid of your cramps, your heavy bleeds, your headaches, fatigue, and irritability, rapidly. Every phase of your cycle should feel good and you definitely should not feel horrible for half of the month due to PMS and your period. Bio-hacking isn’t just for the boys! You can use food and lifestyle switches to improve how your body is performing. You’ll see quick, satisfying, and freeing results. My Monthly FLO program incorporates all of these hacks, and provides a hormone-supportive meal plan, along with tailored support for your specific period plight. Trade in your cow dairy – Cow dairy (containing A2 casein and, often, synthetic hormones and, often, from cows fed with GMO corn and soy) is a cause for heavy bleeding during your period. 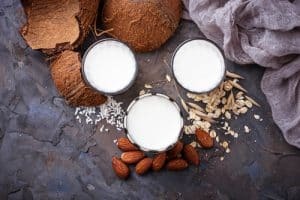 Switching your cow’s milk dairy for goat and sheep dairy, or, even better, nut milks and grain milks (there are so many great alternatives out there now! ), will quickly cool the inflammation in your body. Even if you’re only using cow dairy in your tea, it’s best to make that switch. You’ll have lighter, easier periods from this one simple change. The Monthly FLO protocol encourages dairy detox and going dairy-free, but goat and sheep’s can be a great transitional choice as these contain the less hormonally-disruptive A2 casein. Self-medicate with chocolate – dark chocolate that is! 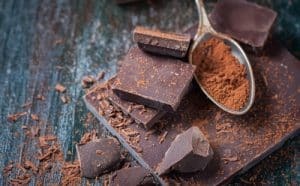 Dark chocolate is full of magnesiumwhich is fantastic for headachey PMS and periods, as well as for combatting the fatigue that can descend around that time of the month. Eat more of it after ovulation, but you can benefit on every day of your cycle. Switch out your morning coffee – coffee is toxic for women. I know that’s hard to hear, but it is, unfortunately, true. I recommend a caffeine detox and switching out your morning coffee (and all your coffees!) 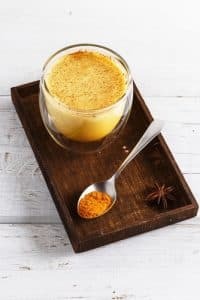 for a turmeric-infused golden milk latte with coconut oil. This will help with cramps directly as it is deeply anti-inflammatory and helps you create the pain-relieving prostaglandins your body needs to fight off uterine contractions. Skipping the caffeine from now on will show marked improvements in your period overall. Choose new period products – did you know that your regular,mainstream tampons can make cramps worse? Not to mention the increased chance of irritation and infection. I recommend switching to an organic, all-cotton, no-chemicals-included brand because regular tampons contain concerning unknown ingredients alongside their pesticide-laden cotton. 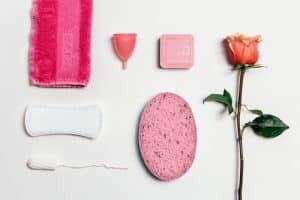 Making sure that you’re using products that are safe, protective, and period-friendly for that week per month, every month, can really make a difference to your experience. Keep a period journal – even if you find it hard to journal every single day (I get it, I don’t do this either), I highly recommend journaling just around the time of your period. This is when your hormones are primed to provide insights, intuitive thoughts, new perspectives, and a desire to make changes. Sometimes that energy can bring about irritability or annoyance with issues that have been nagging at you all month long, but suddenly seem so much more urgently in need of your attention. 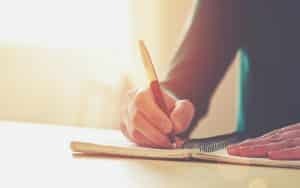 Journaling can help you to explore and examine those issues that arise. You can find the context for your feelings and figure out what you want to do next. Hello, I did the 4 day hormone detox, was a great gateway to helping my hormones.. my bobs stoped hurting , my skin seems to not break out as much., but I’m still dealing with cramps.. I was taking vitex but it says to take a break from that, so now I’m on macca in my goat yougurt with flax meal.. it still is 2 weeks of not feeling great before my period . What else can I do? I stop coffee for 2 weeks of pms, but I can’t give it up all at once. It’s my only vice. Just ordered my first box of Lola and I am very excited! Thank you for all of the great info. You mean a1 casein or a2? What is your opinion on menstrual cups as an alternative to organic cotton pads or tampons? Menstrual cups can be great, but watch out for more frequent yeast infections – this isn’t necessarily an issue for all women, but it can be.